So due to some good ribbing about who and who was not a Guido back in the day – I figured it would be a good time to go back and check on some photos and see if we could bring the old school Jersey Shore and the new school Jersey Shore together! 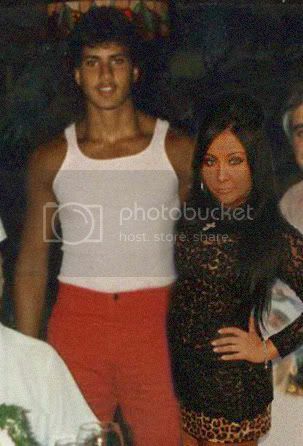 So enjoy Snooki and I on our virtual date- Now that is a Situation! Funny I couldn’t drive yet that but could by alcohol! Holy crap….you were RIPPED back in the day. Snookie who? Is that your wife or a fling you had on the shore? Red Pants! Illegal photoshop! I guess I need to watch more bad tv. Do you know the hangouts they depict on the show? Yeah, forgot I had one of these fancy Disqus accounts. Still can't stop laughing. OMG. I am laughing so hard over here. I can barely type. Goodness you were freaking HOT. All due respect to the Mrs of course. Yeah I went to high school with this and never … Anyway thanks for the walk down memory lane. Wait you do not look like this still? Wow-what a hunk! I had to take a cold shower after viewing that pic! Forget the recipes – keep the 1986 photos coming! LOL Michelle – Not sure how many exist from back in the day! If I still looked that way I would be spending more time in bed than on the internet!